AVAILABLE IN THREE DIFFERENT LENGTHS; 1M, 1.5M, 1.75M and 2.00M NRG Large Snaphook Energy Absorbing Lanyard. 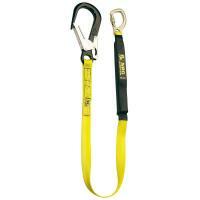 Single leg lanyard suitable for arresting potential falls. The lanyard incorporates a unique "rip stitch" energy absorbing lanyard pack. MANUFACTURED IN THE U.K.
Dike Agility ADVANCE Safey Hiker Boot H S3 SRC Black.